Tell us a little bit about OpenlyPoz.com – when did you create it? OpenlyPoz.com was launched November 16, 2012, on the 19th anniversary of my HIV-positive diagnosis. 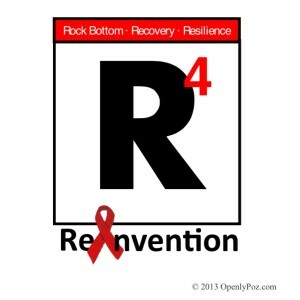 The mission of OpenlyPoz.com is to empower and support my peers living positive, as well as others affected by HIV/AIDS, through sharing my personal stories and experiences of clearing HIV/AIDS and life’s hurdles R⁴ style—sometimes struggling, sometimes succeeding. I believe that by putting a face to HIV, we can lessen stigma and make sure silent voices are heard. Whether or not you are directly impacted, we are all affected by HIV/AIDS. Our voice matters! Being openly gay and HIV-positive, I feel a responsibility to pay it forward to the HIV community, both infected and affected. I live openly with HIV/AIDS in order to reduce stigma – sharing my story to inspire, encourage and provide a voice to those who have been silenced. I am a strong believer in and advocate of the use of social media as a platform for empowerment and advocacy. For HIV-positive individuals living in social isolation or areas with limited HIV/AIDS community, treatment information and support services, social media can provide a lifeline to reach their optimal health and full potential. I also believe in the benefits of personal storytelling in raising awareness, combating HIV stigma and connecting individuals. Though we travel very different journeys, we are survivors in uncharted territory, united through sharing our personal stories and experiences of living with HIV/AIDS – sometimes struggling, sometimes succeeding. The merger of personal storytelling and use of social media naturally led to the path and launch of http://www.OpenlyPoz.com. You talk about your “R⁴” mantra in your blog. What do those 4 R’s mean to you and where did they come from? My story is much more than the daily challenges of living with HIV/AIDS. It is a story of fostering hope and resilience in me and others. It was the positive outcome of that first experience of hitting rock bottom that my 4 R’s have since become my mantra, my guiding force in clearing even the highest hurdle I encounter as I move forward on my journey, and celebrating life each and every day. On your blog, you make sure to point out that HIV lives with you, not that you live with HIV. Can you speak a little bit as to why this differentiation matters to you? Simply stated, I practice people-first language. Rather than using labels to define me and my HIV status, I feel it is more appropriate to use language that describes me as a whole person. Therefore, I don’t live with HIV, HIV lives with me. Yes I am HIV-positive, but first I am Rob. My HIV status, much like my gender, age or sexual orientation, does not define me, but is part of my life and part of what made me the person I am today–optimistic, confident and determined. What kind of impact do you hope to have through your blog both within and outside of the HIV-positive community? While we have made great huge strides in HIV prevention, care and treatment, stigma continues and accessing treatment, including support, remains difficult for people living with HIV. According to the Centers for Disease Control and Prevention (March 2015), approximately 50,000 people become newly infected each year. 9 in 10 new U.S. HIV infections come from people not receiving HIV care, which highlights the importance of getting tested. Stigma and fear keep many from getting tested for HIV. On my forward journey aging with HIV/AIDS – sometimes struggling, sometimes succeeding – it is my hope that through OpenlyPoz.com I can make a positive community impact by furthering my work advocating for increased awareness, decreased stigma, and the chance eventually to an AIDS-free generation. First and foremost, I will use this platform to connect, support and empower individuals both within and outside of the HIV community through on-going conversations about awareness, the importance of testing and taking full responsibility for one’s own sexual health, open and honest communication about HIV status, reducing stigma, education, the challenges of an aging HIV population, responding to the changing needs of the HIV community, and more. Whether or not you are directly impacted, we are all affected by HIV/AIDS.